The battle of the bulge just got a little bit bigger. It’s no secret that fighting fat is hard and even harder to fix in the long term. Read on and check out my latest CBS NY segment for more on this great topic! Even if you eat less and move more your work can still be cut out for you, especially if you don’t have the right bacteria on your side. A growing body of research is pointing toward how certain bacteria can make you fat and make it even harder for you to lose weight. Our body is a collection of bacteria, most of which are good, helping our body run smoothly and fight off disease. But the 10% that are not, are notorious fat-loving bacteria which have been discovered to be far more common in people who have weight problems. Fat loving bacteria live in your gut and release toxins that can negatively affect certain genes involved in fat activation and breakdown. This in turn leads to more fat. These gut bugs also spit off inflammatory chemicals that increase your risk of cancer and other nasty conditions like heart disease and diabetes. 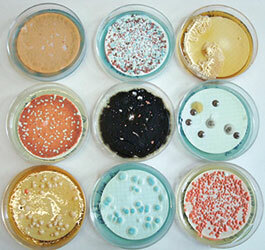 Fat loving bacteria are super hungry and very efficient at extracting and storing calories in you so they can survive. It’s a vicious cycle that can make it hard for you to manage your appetite as fullness signals are interrupted and hunger management is even more difficult. The good news is that this may be fixable. You can starve your fat bugs by reducing calories. As you lose weight the proportion of lean bacteria improves. There are promising studies done in mice showing that transferring lean bacteria to obese mice led to their weight loss. While this is still experimental, in the meantime you can work to change your gut flora naturally. But before you reach for a bottle of probiotics or start gobbling down yogurt, realize that there are many healthy strains of good bacteria that your body needs. Their specific role for various conditions is not yet determined so it’s best to look to a wide range of food sources to cover your bases. The key to finding healthful probiotic bacteria comes from the age old practice of fermenting foods for preservation. Many cultures have their own unique food product that was routinely used in their diet. These foods provide nutrients, introduce healthful strains of bacteria, guard against illness, fight inflammation and may have contributed to a lean physique by fighting off fat loving bacteria. You can find healthy bacteria in a wide range of foods, herbals and botanicals. Some are quite common like yogurt, kefir, leben, ayran, fermented cheeses, miso, tempeh, kimchi, barrel cured sauerkraut, aged unfiltered vinegars and kombucha tea, while others may still be considered relatively exotic and need to be purchased at ethnic markets. Bring on the bugs but don’t forget to feed your little lean critters with their preferred food. Prebiotic foods give your healthful bacteria the energy to grow and colonize in your body. Switch out refined sugars and starches for fibrous plant foods. Top food sources include beans, legumes, sulfur rich cabbage family foods, onions, garlic, field greens like chickory and dandelion, bran, wheat berries, buckwheat, oats, flax, tomatoes, kiwi, cherries and berries. Show your fat bacteria the door! In just a few days fighting fat just got easier as you put lean bacteria to work for a new you. Check out the latest medical news on CBS NY!